FULTON, NY – Despite a decrease in teen pregnancy nationwide, teen pregnancy continues to be a concern in Oswego County. To help raise awareness of, and address the issue of teen pregnancy, Oswego County Opportunities Health Education and Crisis Development Services is stepping up its efforts to reverse the rate of teen pregnancy in Oswego County. Oswego County Opportunities Health Education and Crisis and Development Services are partnering with the Oswego County Health Department to raise awareness of and reverse the trend of teen pregnancy in Oswego County. Pictured are members of the planning committee. In front from left are: Stephanie Meeker (OCO OPTIONS), Cheyanne Vasquez and Chelsea Avery (OCO Health Education Peer Specialists) and Sonia Robinson (Oswego County Department of Public Health). Back Row (from left): Shannon Endsley, Ellen Lazarek and Chelsea Kaye-Bidinger (OCO Health Education), Anna McNamara (Oswego County Department of Public Health), Alyse Fleming (OCO RHY). 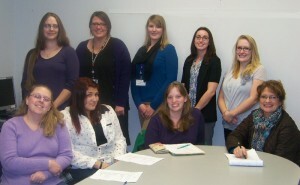 While area Health Centers are working on providing young people with accurate information and the latest methods of pregnancy prevention, Ellen Lazarek, collaboration manger, OCO Health Education and Crisis Development Services, said that collaboration between OCO other youth serving programs are working together to provide programming that address teen pregnancy in Oswego County. To achieve these goals, Lazarek is reaching out to both youth and adults and encouraging them to take an active part in their efforts to raise awareness of teen pregnancy in Oswego County and what can be done to prevent it. “We welcome input from parents and invite them to be a part of our Oswego County Health Youth Alliance advisory board that includes representatives from across Oswego County. Additionally, we would like to increase the number of young people that participate in the OCHYA to include representation of all nine area school districts, so that youth can be involved in the planning and implementation of future programming,” she said. Bringing parents and youth together as part of the planning process is a key component, as parent / child communication plays a vital role when it comes to reversing the trend of teen pregnancy. “We know that young people listen to other young people. If we have youth sending a positive message with accurate information, their peers are more likely to listen. We also know that youth really do listen to their parents. If parents are having discussions with their children regarding their hopes and aspirations for them and why they do not want them to be a teen parent, that is powerful. We hope to encourage that by reaching out to youth and asking them to identify whom the supporting adult is in their life and giving them the tools to successfully communicate. We are also asking parents how we can help them and provide them with resources they need so that they too may communicate successfully. To accomplish that we will be establishing a training component for professionals and other service providers regarding current trends with unplanned teen pregnancies and how their expertise can benefit both parents and youth,” explained Lazarek. In addition to the focus of involving youth and parents in their efforts, OCO Health Services is planning a number of events that will highlight National Teen Pregnancy Prevention Month, which is recognized in May. “Last year we attended and hosted health fairs at schools throughout Oswego County and recruited salons and florists to help us raise awareness. This year we are hoping to reach young people and adults through community outreach, education, and resource fairs in Oswego County high Schools. We also will be reaching out to adults through other support programs in the county; maintaining an open dialogue with youth leaders and school districts, increasing our presence at community events, and inviting community members to visit our Facebook page, www.facebook.com/fultonyouth4youth for information on our programs, meeting schedules, and more,” she added. For more information regarding parent/child communication, community resources, teen pregnancy prevention, or adolescent sexual health, please contact OCO Health Education at 315-592-0810 or OCO Crisis & Development Services at 315-342-7532. OCO, Inc is a private, non-profit agency that has been supporting communities throughout Oswego County since 1966.